What do we want our children to be is a question that we as teachers ask ourselves very often. We want them to be safe, happy, healthy, curious, kind, humane, respectful and empathetic. They should be able to engage in dialogue with everyone, even those with whom they might disagree. And what better way to begin nurturing these qualities than gupshup over a story, a poem or a well-written article? One cannot agree more that listening to different voices and breaking stereotypes is what good literature does to us. 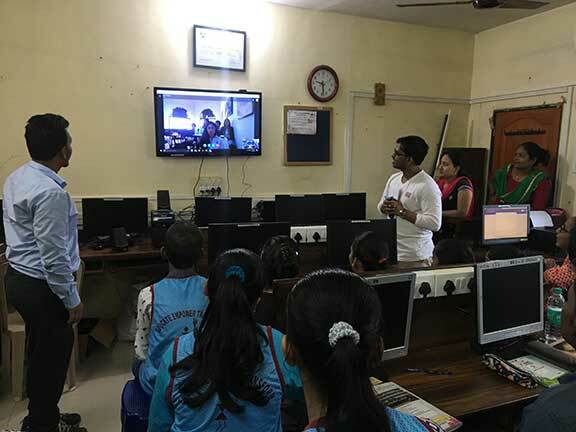 We organized this gupshup, via a skype call, between our students at VIDYA, Mumbai (www.vidya-india.org) and students from across the border, from a school in Islamabad, Pakistan with help from author/educator, Anam Zakaraia. Anam’s much-acclaimed work, Footprints of Partition is helping scores of people reflect, reconnect and engage in dialogue and build an archive of stories of a shared history. The skype call was exciting for both the children and teachers as we were able to hear and see with wonder “the other” and enjoy the warmth of dialogue. It was also a means for us to integrate values of peace in VIDYA’s holistic education mission. But first things first, for a dialogue to happen the parties involved should have a topic to discuss. We (Anam and us at VIDYA) decided that the children and facilitators on both sides will read an article by Omer Aziz (http://gulfnews.com/opinion/thinkers/read-till-the-end-what-happened-to-this-pakistani-immigrant-kid-1.2054239). Omer is a writer and the son of working class immigrant Pakistani parents in Canada. We decided to give the article our own title, “The invisible man”. Initially, we did wonder whether our students (of grade 8/9/10) could handle the piece independently in English as they all went to regional language schools. But the concern was set aside, as we felt that our students could relate to what the author has written as they too were grappling with similar situations. The facilitators at VIDYA worked hard to make the article comprehensible for the children by using a lot of Hindi and simpler Engilsh. Besides reading the article with the students, facilitators Swapnalee and Rakeem also helped them get familiar with Pakistan – its food, music, dance, etc. During this familiarization exercise we discovered that there were so many layers to peel, stereotypes to break; biases run deep and we are only human. The session began with our children asking about the common career choices in Pakistan. They learnt that in Pakistan most people opt for engineering and medicine, although there was a slow shift towards other creative professions as well. Engineering and medicine are the favoured choices here too but there is also an inclination towards chartered accountancy, teaching and IT-related fields. We then asked our new friends about the National Archives of Pakistan. Anam said that that is where historical artefacts, photographs, etc., are stored and that not many people visited it. Anam was very humble when she said that perhaps our (VIDYA) students knew more about this topic as they seemed to have done extensive research on it prior to the session. When asked about how popular the pro-kabaddi league (which is very popular with our students and was ongoing at that time) was in Pakistan, one of the boys responded saying his grandfather was a kabaddi player and that he used to watch kabaddi a lot as a child but not anymore. The discussion progressed to the migration of family members during partition. Most of our students hailed from Maharashtra and as such did not know anyone who had migrated to Pakistan. But one of the girls did make a connection to her teacher, Jayshree, whose family had migrated to India from Burma during World War II. A couple of students from the Pakistan side had grandparents who had migrated from places like Patiala. Our teacher, Ajay, recalled his interaction with his friend’s grandmother, who had migrated from Lahore. For her, the memories were still strong, the pain of violence intense, but she had made her peace. She had forgiven, but not forgotten. We then moved to discussing, “The invisible man”. “Omer turned to education to purchase freedom” – why had the writer used the word purchase instead of acquire? This came from a VIDYA student. It was a difficult question and could have many interpretations. One of their students responded saying since the author was the son of migrant parents, he was struggling to find his identity and maybe education was expensive, the struggle he faced along with expensive education may have prompted the use of the word ‘purchase’. Another interpretation came from Jayshree – as the son of working-class parents, Omer Aziz did not inherit education and was perhaps the first in his family to get an Ivy League education. Omer certainly had to work hard and pay his way through. VIDYA students shared the names of good Hindi writers such as Munshi Premchand and Harivanshrai Bachchan and this led to one of the girls sharing a beautiful couplet from Urdu Poetry. Questions then moved to topics such as the influence of others in our lives and being in different situations and the importance of history. Students from across the border strongly felt that we should not depend on what others think about us, we should be ourselves. And yes, while we may listen to “the other’s” opinion it should be in a broader context as sometimes their opinion can affect us. VIDYA students however felt that friends, parents and peers do affect and influence us in a big way, and that it’s our attitude and perception towards them that will make the change. We then had an interesting question, “Why the title, The invisible man?” Gaurav from VIDYA said that maybe the author was looking for his identity, that’s why the title. Ajay chipped in saying history helps us know our ancestors and also makes us aware of mistakes we should not repeat. “I am nobody but myself”. This was interesting in the context of Omer’s family migrating to another culture. Two divergent views emerged from the students across the border. One said that when we go to another country we should try assimilate with their culture, whereas the other said we should celebrate our own culture in the new lands without harming the other’s culture. Both sides agreed that life is a long journey and Ajay added that no matter what we are, somehow we try to be like others whether intentionally or unintentionally, and maybe we have realized it but have we accepted it? The interaction ended with VIDYA students offering virtual mithai and namkeen to their friends from Pakistan. Homemade laddoos, karanjis and Chivda made their appearance to squeals of delight from everyone on both sides. And when asked if we would like to visit Pakistan, it was a huge, resounding yes from all at VIDYA. A quick debrief on the takeaways from the call revealed the children’s insights – they felt that the students from Pakistan were easy communicators, spontaneous and good looking, well-built and confident. The girls at VIDYA felt that they (in Pakistan) were perhaps given more freedom, as their school allowed them to come with their hair open and not plaited like VIDYA insisted its students to. All the Indian students were so aware. They were very willing to answer all questions and we felt as if we weren’t as ready. They were so well prepared. We are really impressed. They were very accepting and did not stereotype us. We thought of them in terms of stereotypes but when we spoke to them that changed. They are no different from us. Offering us mithai was very sweet of them! It was really fun talking to them. They were very enlightening. We learnt what people on the other side think. There is a misconception that there is animosity on both sides but speaking to them shows that that’s not true. The authors are teachers at VIDYA, Mumbai. They can be reached at swapnalee.gurav@vidya-india.org.